Yes, I am one of the fans of Bejeweled. 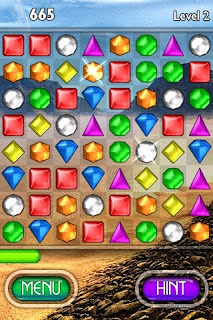 For those other fans out there, here are five things that you didn't know about Bejeweled courtesy of Yahoo! Games. 1. It's a money machine. Did you know that PopCap Games tried to sell the rights of Bejeweled for just $40,000. However, no one bought it. PopCap Games then have decided to self-publish. Since 2000, it has now generated over $350 million dollars. It is available on PC, Facebook and even on iPhone version. 2. It can be beaten. Only one person officially completed Bejeweled 2. It was Mike Leyde, a 57-year old steel contractor from Riverside, California with 2,147,483,647 points. 3. It's voiced by its maker. Jason Kapalka, Bejeweled’s designer and chief creative officer of PopCap was the voice over of the game. To those curious, yes it was modulated! 4. It spawned hundreds of imitators. There are more than 200 knock offs of the game. The 1 minute Facebook application has attracted 3 million players per day.